Zhichen Ontrul Rinpoche was a main lineage holder of Katok Monastery, a student of Tulku Tsullo, and also very close to Bairo Rinpoche. He received many teachings from Dudjom Rinpoche in India. Zhichen Ontrul Rinpoche was born in Amdo of Eastern Tibet, as prophesized by Thupten Chökyi Dorje, the Fifth Dzogchen Rinpoche. He was recognized as an incarnation of Thangtong Gyalpo. His immediate previous life was as one of the head masters of the Katok lineage. Zhichen Ontrul Rinpoche residing and was trained at Shyichen Monastery, with Bairo Rinpoche. After accomplishing his common monastic education until the age of 18, Zhichen Ontrul Rinpoche was in charge the various branch monasteries of Shyichen Monastery throughout Eastern Tibet. He took the responsibility for searching the reincarnation of Zhichen Vairochana in Derge and Dzongsar, and discovered Bairo Rinpoche, with the help of Jamyang Khyentse Chökyi Lodrö and later on, he enthroned Bairo Rinpoche in Shyichen Monastery. Then, Zhichen Ontrul Rinpoche realized that taking responsibility of the monasteries and looking after the administrative activities were similar to mundane affairs, so he wanted to go into retreat and follow the genuine masters so as to learn the uncommon path of spirituality. But he was requested by his people not to leave his monastic responsibilities. He decided to fall sick and he told his subjects, "If you don't allow me to follow the uncommon spiritual path, there is no point for me to live and carry on this way. It is your choice to let me go or stay." His people had to let him leave according to his wishes. So my father, Bairo Rinpoche, took the responsibility of taking care of the monasteries. 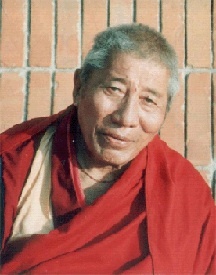 Zhichen Ontrul Rinpoche’s first destination was Baney Retreat, where he followed the master Choktrul, from whom he received the Changter tradition. After staying at the Baney Retreat for a number of years, he heard about Tulku Tsultrim Zangpo, and he went to follow his teachings. From Tulku Tsultrim Zangpo, Zhichen Ontrul Rinpoche received the uncommon Dzogchen practice as well as the common teachings of three yanas of Buddhism continuously for 18 years. Tulku Tsultrim Zangpo qualified him as a lineage master and asked him not to hesitate to teach whoever approached him. But Zhichen Ontrul Rinpoche did not leave the retreat place of Tulku Tsultrim Zangpo until his master passed away. In early 1960's, Zhichen Ontrul Rinpoche fled to India with many other masters and his own subjects. Later on, in Kalimpong, India, Zhichen Ontrul Rinpoche received Dzogchen teachings from Dudjom Rinpoche and many exchanges took place during this time with many other Dzogchen masters. Zhichen Ontrul Rinpoche wanted to stay in a nyingma monastic environment, but at that time, he could not find any. So he thought about following Polu Khenpo, but he found out that Polo Khenpo had no permanent retreat place where he could reside and practice. He then decided to stay at the Drepung Gomang because he said to me, "By staying in that kind of monastic community, I would have no obstacles in spiritual practice, such as mundane attractions." Zhichen Ontrul Rinpoche stayed at the Drepung Gomang until the late 1980's, when my father Bairo Rinpoche and I requested him to train me, and for that purpose, he moved to my monastery. Years later, Zhichen Ontrul Rinpoche went to Tibet to fulfill his final responsibilities, and he benefited many people there. After a short stay in Tibet, he passed away. This page was last edited on 6 November 2017, at 07:26.